This is an update to a previous blog, Health Hazard Alert: Certain Reser’s Fine Foods Brand Cheesy Macaroni Salad is Recalled. Regarding the Canadian Food Inspection Agency’s (CFIA) ongoing food safety investigation, the voluntary recall update now includes a second list of the following additional product. CFIA’s Recall /Advisory date: October 21, 2013. CFIA’s first alert, regarding Reser’s Fine Foods Brand Cheesy Macaroni Salad, is now identified as 2013-10-05b – Certain Reser’s Fine Foods brand cheesy macaroni salad may contain Listeria monocytogenes with reference number 8372. This product has been distributed in Walmart stores in New Brunswick, Newfoundland and Labrador, Nova Scotia, Ontario, Prince Edward Island, and Quebec. Ottawa, October 21, 2013 – The public warning issued on October 5, 2013 has been updated to include an additional product. 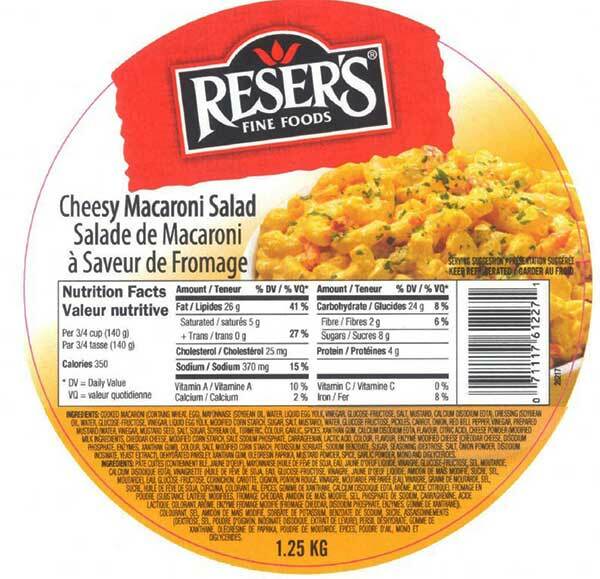 The Canadian Food Inspection Agency (CFIA) and Reser’s Fine Foods Inc. are warning the public not to consume certain Reser’s Fine Foods brand Cheesy Macaroni salad, described below, because it may be contaminated with Listeria monocytogenes. The manufacturer, Reser’s Fine Foods Inc., Beaverton, Oregon, USA, is voluntarily recalling the affected product from the marketplace. The CFIA is monitoring the effectiveness of the recall. Ottawa, le 21 octobre 2013 – La portée de la mise en garde du 5 octobre 2013 a été mise à jour afin d’inclure un produit supplémentaire. L’Agence canadienne d’inspection des aliments (ACIA) et Reser’s Fine Foods Ltd. avisent la population de ne pas consommer la salade de macaroni à saveur de fromage de marque Reser’s Fine Foods décrite ci dessous, car elle pourrait être contaminée par la bactérie Listeria monocytogenes. Ce produit a été distribué dans les magasins Walmart. Le fabricant, Reser’s Fine Foods, situé à Beaverton, Oregon, États Unis, retire volontairement du marché le produit visé. L’ACIA surveille l’efficacité du rappel. Author editorPosted on October 22, 2013 October 22, 2013 Categories Community, Health & WellnessTags canadian food inspection agency’s (cfia), may be contaminated with listeria monocytogenes., recall classification: class 1, reser's fine foods brand cheesy macaroni salad, reser's fine foods inc. Previous Previous post: Health Hazard Update: Fourth List of Recalled Ground Beef Made by Belmont Meats Ltd.
Next Next post: Health Hazard Update: Fifth List of Recalled Ground Beef Products Made by Belmont Meats Ltd.